Acting national police commissioner Lieutenant-General Khomotso Phahlane last weekend spent two hours in Tembisa, Gauteng, and did not spot a single police car in that time. He should not have been surprised. The 2015/16 Victims of Crime Survey by Statistics South Africa showed declining police visibility since 2011, putting it plainly: “Never seeing police on duty was most common amongst households headed by black Africans.” But on Wednesday Phahlane could tell MPs that by midnight the day he visited Tembisa, the cluster police commander had called all the station commanders under his command to chew their ears as to why there were no patrols. That is the power and politics of policing. By MARIANNE MERTEN. The power and politics of policing reaches far and wide, including politicians spending time at crime scenes like this week’s May Day hostage drama in Nyanga, Cape Town. 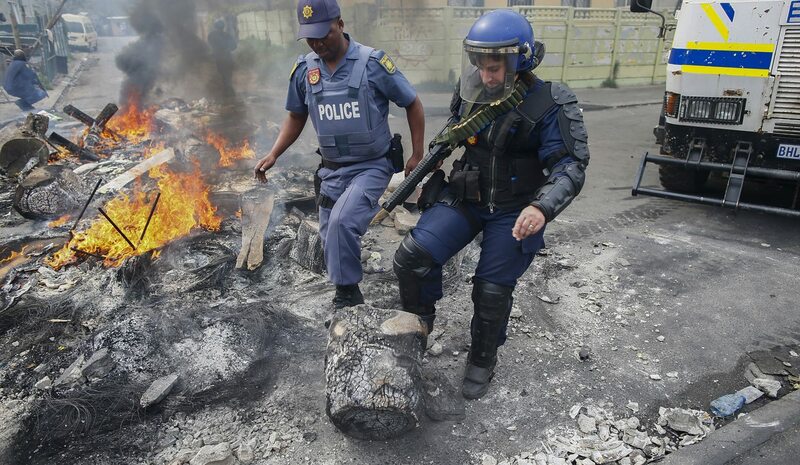 “I had to fly from Pretoria to give moral support to police on the ground. They had not eaten the whole day, fighting robbers wanting to steal Sassa money,” Deputy Police Minister Bongani Mkongi told the police committee on Wednesday. The newly appointed deputy minister had taken exception to Freedom Front Plus MP Pieter Groenewald’s comments that Police Minister Fikile Mbalula a day earlier had merely popped in, spoken, and left. That statement needed to be withdrawn because apologies had been tendered before the minister left, said Mkongi. Mbalula on Tuesday traded MPs for police and residents of Nyanga. The meeting between the police’s political bosses and police who ended the hostage drama is recorded on Twitter in words and photos. “Great afternoon spent with the people who keep us safe #WanyaTsotsi” reads the caption to a group photo with police officials, the last photo in a series also including Mbalula’s walkabout in the now safe Nyanga shopping centre. And then he tendered his apologies to attend the Joint Standing Committee on Intelligence (JSCI), a meeting which later in the day accounted for the absence of police crime intelligence officials from the police committee meeting. What was discussed at the JSCI will remain unknown as that committee as a rule sits behind closed doors, while the discussions before the police committee are open. Over eight hours Phahlane and his senior police managers were asked why security vetting is not up to scratch, a lack of vehicles for detectives and public order police and dropping performance targets. The 37% detection rate for serious crimes, according to the SAPS annual performance plan, was another sore point for MPs across the party-political divide. The current target is one percentage point down from the 38% detection rate set for the 2016/17 financial year, and effectively marks a return to the target set three years ago. But Phahlane insisted it was pointless setting targets that were not achievable. At the end of the last 2016/17 financial year on March 31 the serious crimes detection rate stood at 36.13%. Thus the 37% target set for the current 2017/18 financial year was both realistic and would encourage detectives to “stretch” themselves. “Our research has proven even if we implement specific interventions there is only a one to three percent improvement,” said the acting police commissioner, adding that he was happy that although the targets were low, they were now being achieved. The next step would be raising the targets. Police committee chairperson Francois Beukman was not quite convinced by that explanation. “If we set the targets too low,” he said, “you can pat yourself on the back, but you are not actually achieving anything.” But the matter was diplomatically deferred as one on which views would differ. But the issue of disappearing targets – from numbers of trial-ready dockets to convictions related to violent public protests – showcased another side of police power and politics. Phahlane argued that the indicator of trial-ready dockets was “meaningless” as police sent dockets to court and ticked the trial-ready docket target, but then a prosecutor would return the docket with further requests. The docket would be retuned to court – another tick – but could end up with police again because now another prosecutor was allocated. The target “means nothing”, said Phahlane, arguing it related more to courts than police. Ditto prosecutions of those arrested in violent protests. The SAPS should not be held responsible for courts releasing suspects on bail of as little as R300, as happened in Coligny, the North West farming dorpie that was on edge this week following the arrest of two white farmworkers over the death of a black teenager, or at Vumani, Limpopo, where protests erupted over demarcation in the run-up to the 2016 local government elections, but suspects arrested were released on bail to return to the community to mobilise again. “It’s beyond our control… The courts make that decision. Who is being noted as not performing? We. But do we have control over it? No,” was the acting national police commissioner’s response. MPs did not ask whether there may have been issues with the quality of dockets. But Phahlane’s comments on the courts and bail were taken up by ANC MP Livhuhani Mabija, recalling President Jacob Zuma’s similar commentary that police believed it was too easy for those they arrested to get bail, following visits by the president to two police stations earlier this year. Zuma, most recently during his address to the National House of Traditional Leaders in March, said: “Let us have a law, when people say he sells it (drugs), arrest him. Let us have laws that makes it easy to arrest criminals.” It also emerged that had Zuma met security cluster ministers, leading to a review of criminal justice legislation to look into matters including “issues of state security and issues of national sovereignty” in bail procedures. Power and politics are never far from policing, or crime, which regularly features alongside unemployment among top concerns for South Africans.